If you are looking for bloggers, professional writers who understand what attracts readers and holds them there, we can help. We have been blogging for over a decade, creating captivating posts that get read and get shared in social media. When hiring bloggers from THGM, you get a one-stop service for your blog. We will write the blog posts. We will find an appropriate royalty-free image to include in the post. We will publish the post (if you wish) or send it to you as a draft. We can also help promote your blog in social media. Professional blog writers and promoters can take an obscure blog and give it credibility and authority. We can write to whatever specifications you desire, or we can advise on what is best, based on your main goals, either for your own blog or guest posts to publish on other blogs. Just fill in the form on this page to let us know what kind of blog writing help you need. Our writers have written for blogs of every topic, from personal finance blogs to fitness and nutrition, from business and corporate blogs to entertainment and recreation. They take the time to research the topic and write compelling posts that appeal either to a) your narrow audience or b) the wide world beyond your niche (but always on-topic). If you are ready to find a blogger now, just fill in the form on this page and let us know how we can help you. Not every business that runs a blog wants to hire a full-time blogger. Some prefer to outsource blog writing to a professional. If you want to hire a professional blog writer to make you look good, connect with your audience and spread the word, we can help. 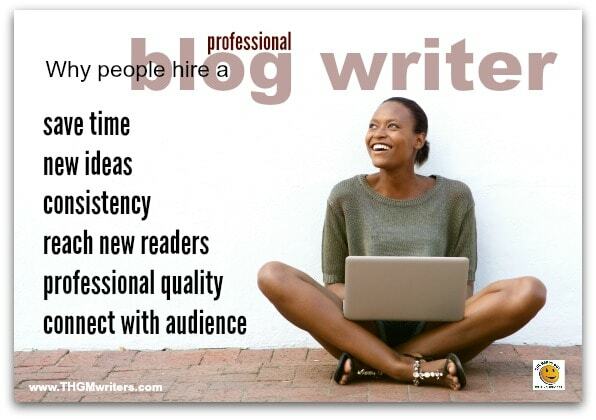 Tap or click to read more reasons to hire a professional blog writer. You hire a professional blog ghostwriter to save time. What is the number one reason a business would hire a pro blogger rather than using staff to write the articles? To save time. You hire a blog ghostwriter for professional quality content. It’s not just the time you’ll save when you outsource. It’s also the quality you’ll gain. Your staff are the experts on your business, your products and your services. But they are not experts at writing. Hiring a blog writer gives you better content. In a nutshell, we make you look good. And that’s important if you want to convert readers into buyers, followers or fans. You hire a professional blog writer to connect with your audience. A professional blogger knows how to connect with your audience. A business grows best when the audience is engaged. Your blogger can often get readers involved in the discussion by how she writes and by how she promotes the articles in social media. You hire a freelance blogger to reach new readers. Not all bloggers for hire also help promote a blog post. We do. We understand that the only way to grow your audience is to relentlessly promote your blog posts in social media. If you can’t give a strong promotional push to your blog posts, that is something to outsource. Ideally, your blog writer can also do the promotion. We certainly provide that service. Your blog can be a world-class traffic magnet, helping to reach new audiences. We can give you the quality, quantity and promotion it needs. For a free quote on ghostwriting your business blog or any other articles, tap or click the red button to the right. Working with a professional blog writer can be easy or hard. It’s really up to you. Here are some handy tips for working with a freelance blog ghostwriter. Tap or click to read more on how to work with a pro blog writer. Feed ideas to your blog ghostwriter. Your ghostwriter know how to write. She is the expert at writing. But she doesn’t know your business as well as you do. Even if she’s been writing for you for years, you know your business better than your blogger ever will. A blogger well-armed with ideas will light a spark that will shine through for the audience. Make sure he always has plenty of ideas on tap. You can also encourage him to come up with his own ideas, but best if you approve them and even give some direction on how to approach them. Answer your freelance blog writer’s questions. There’s a good chance that your blog ghostwriter will have questions for you. There will be details, and you probably did not think to send them all along. Answer those questions in a timely manner. One of the worst things you can do is to be a silent client. If you are unresponsive, if you don’t appear motivated to produce a great blog, don’t expect your blog writer to be motivated. He’ll keep writing, but the quality won’t be the same. When you respond quickly and completely, you keep the momentum going and give a sense of importance to the project. You motivate your ghostwriter. Let your freelance blogger write. If there is one thing that is almost as demotivating to a freelance blog writer as a non-responsive client, it’s a backseat driver client. If you are constantly nit-picking at all the wording in your posts, your blog writer will quickly stop caring about the words. Here’s a good rule of thumb. If you can’t live with what your blogger is writing, hire another blogger. That’s not to say that you should never comment. But those comments should be to give broad direction, either for content or style, not to nitpick individual words. You’ve decided to outsource your blog writing. For a free quote, tap or click the red button to the right. Our blog writers are for hire, at your service. If you are looking for bloggers who can take your blog to the next level, let us know how our blogging services can help you by completing the form on this page.